It seems like there’s been an influx of new 2D beat ’em ups on the App Store in these past few months, and get ready to add another to that list. 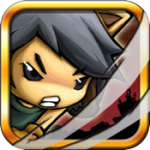 Wolf Boy [99¢] is a single plane side-scrolling brawler similar to games like Zombieville USA [$1.99 / Free] and Twin Blades [$2.99]. The actual gameplay is rather simplistic, but it features a really appealing art style and best of all it allows you to change from a cute (albeit angry) little boy into a ferocious werewolf to dispatch the many enemies in the game. The arcade style button mashing may not appeal to everyone, but for those that don’t mind the simplicity, Wolf Boy offers a visually appealing and challenging game. Like many games before it, Wolf Boy begins with your special lady friend being taken from you by an evil enemy. This ignites your rage, and starts you off on a journey to reclaim her. Left/right arrows in the corner control your movement with a button for attacking and separate button for jumping or double jumping in the opposite corner. Double tapping either arrow will perform a dash in that direction, and if you couple that with an attack you’ll pull off a powerful dash attack maneuver. The combat is melee focused, and an assortment of weapons and powerups (like huge swords or hammers and temporary invincibility) can be found throughout the levels. It’s nothing groundbreaking, but the virtual controls work well and there’s a decent amount of variety in your offense. What is really cool about Wolf Boy is that as you defeat enemies a gauge shaped like the moon will slowly fill in the upper corner. Once full and flashing, touching that moon turns the boy into a more powerful werewolf and let’s you wreak havoc as such on enemies for a period of time. 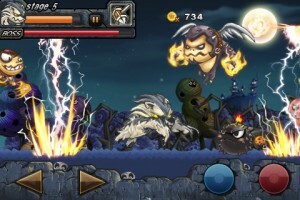 As the werewolf you won’t take damage and are much larger, allowing you to take out airborne enemies without jumping. The werewolf mechanic throws a nice wrinkle into the gameplay, as you might strategically wait to use it until there’s a slew of enemies onscreen or your life is almost depleted. Plus, it’s just really satisfying to turn into a huge werewolf and wreck shop on some bad guys. Coins are collected during the level and after defeating enemies. After each stage you can spend these coins on upgrades, and both the boy and his werewolf incarnation can be upgraded independently. The boy can be upgraded in health, speed, and attack power. How quickly the moon gauge fills up and how long you stay transformed can be upgraded for the werewolf, as well as attack power. Like the gameplay, it’s a fairly shallow system but it works well and is balanced out nicely with your progression in the game. While not reinventing the genre, Wolf Boy is an entertaining game with plenty of action, although it can tend to feel a bit repetitive. This fact is even more pronounced due to the great length of the game. In the game’s forum discussion, member sammysin has made it all the way to level 38, which is no small feat and earns him the title of “most hardened Wolf Boy player” but still does not indicate when the game will end. At any rate, you can at least be assured you’re getting plenty of bang for your buck. For my money, Wolf Boy is worth the price based on visuals alone, and the icing is that it’s also a relatively fun game, adding yet another solid option to the crowded 2D brawler genre. The 2nd Update of Wolf Boy! Next PostNext ‘Archetype’ Online First Person Shooter Launches in U.S.